This year was going to be our last shot at growing tomatoes. The last few summers haven't been too productive on the tomato front and they had started to feel like too much effort for not enough return. But, guess what - the little red fellows finally came through for us. 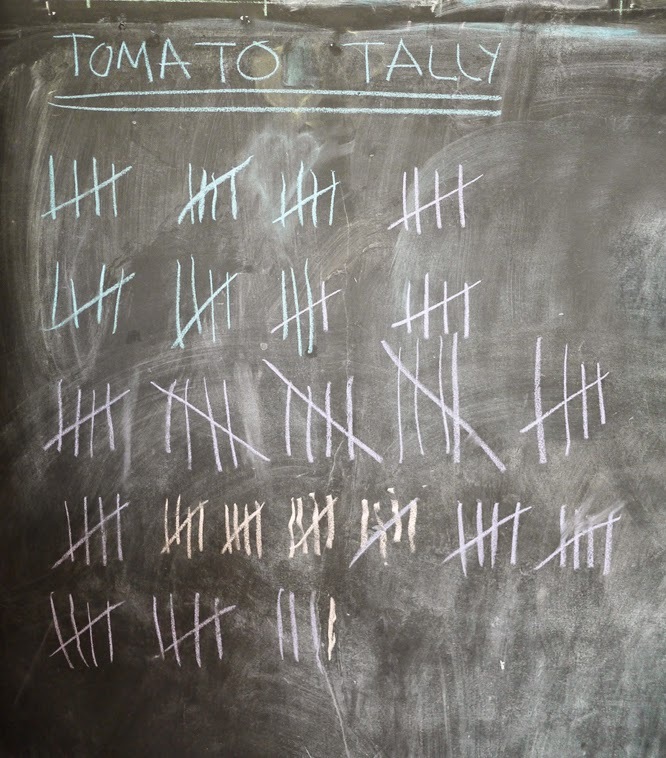 We were so close to giving up that I started a tomato tally on the blackboard; we stopped logging tomatoes consumed around a month ago. We just had too many. 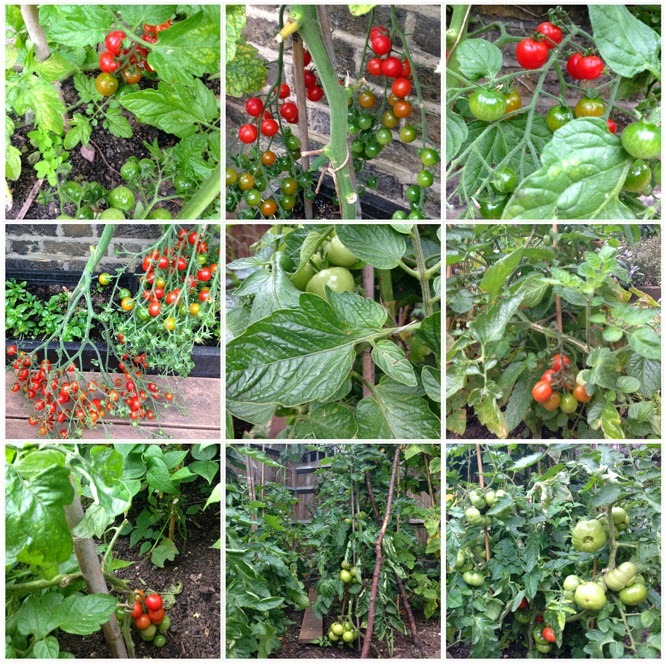 In fact we've had an amazing year... starting with 'gardeners delight' which we bought as plants, followed by waterfalls of cherries which we grew from seed and a great selection of weird and wonderful varieties that my sister gave us. The main bulk of the plants grow by the house up against a warm wall (and across our kitchen window by this time of year). Hugh sunk some much bigger planters into our decking area in the spring and I think these have been the key to our new success, (well those and the weather) but we also sort of shoved in plants in and around the other veg too and they have literally taken over, creeping across every bit of exposed soil - it's a bit like The day of the Triffids out there. 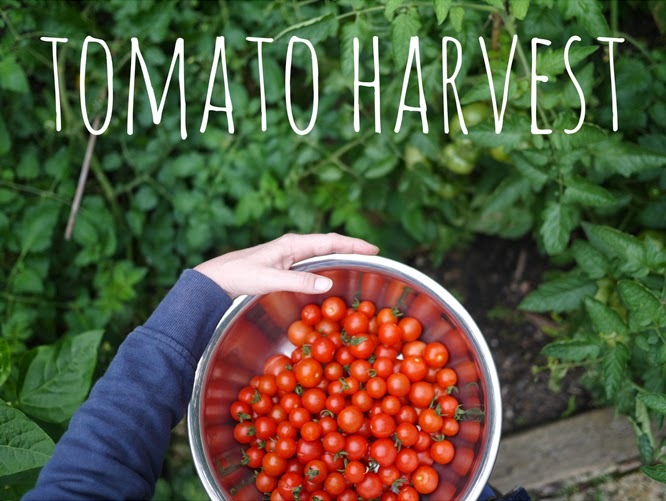 I think the reason I'm so amazed by the harvest is that I really don't think of myself as a garden person. I'm not the green fingered one in my family, and up until five years ago I'd never had a garden at all, ever. I can't quite get my head around the fact that for the last two months we've pretty much eaten something from our garden everyday. 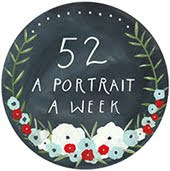 I suppose for lots of people that's totally normal; so forgive me for sounding like I think some kind of miracle has occurred... but, um, I kind of do. I never would have imagined that I'd have enough tomatoes that I'd want to cook with them (ok; I'll stop with this amazement at my garden miracle now). 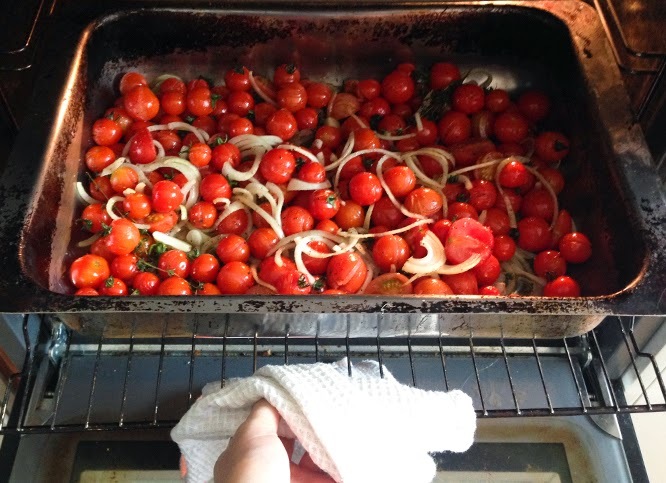 Heat some olive oil in a hot oven - once it's almost smoking tip in 1kg of halved tomatoes (Gordon says plum are best - but as you can see I used a variety and it worked fine! ), an onion cut into rings, a couple of cloves of garlic, a teaspoon of caster sugar and a few thyme sprigs. Season and cook for 20-25 minutes - adding a few basil leaves just before the end of cooking. 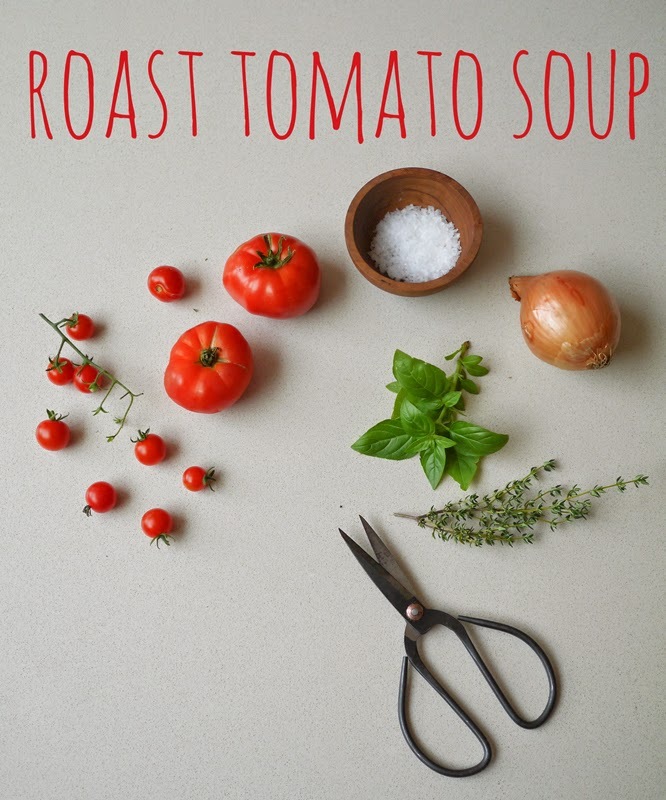 Meanwhile heat up 1 litre of stock and then when the tomatoes are cooked tip them into a pan, discard the twiggy bits of thyme (and in my case the tomato stalks) and then add the stock in. Gordon says add some smoked sun dried tomatoes at this point and 1tbsp of BBQ sauce. I just added 3 regular sun dried tomatoes. Bring to the boil and cook for 5 minutes. 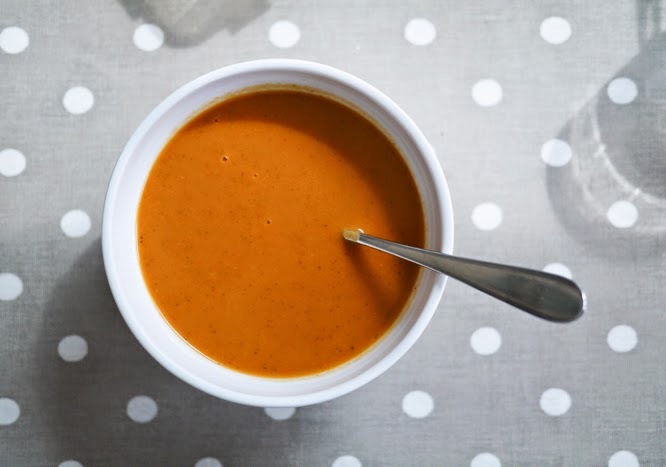 Strain the mixture and then whizz up the tomatoes in a food processor, once you have a paste gradually add the stock back in. When finished you can strain the remaining mixture through a sieve to get rid of any rogue seeds. 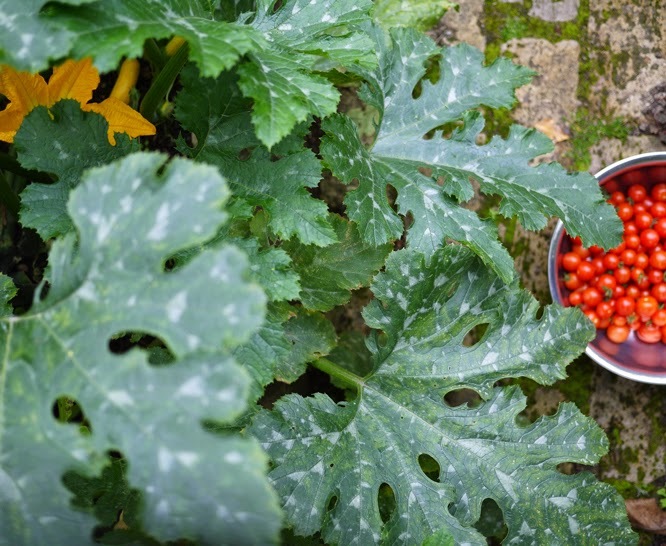 Because I used lots of cherry tomatoes we had loads of seeds so it was definitely worth the hassle of removing them. It was delicious - a perfect Saturday lunch.